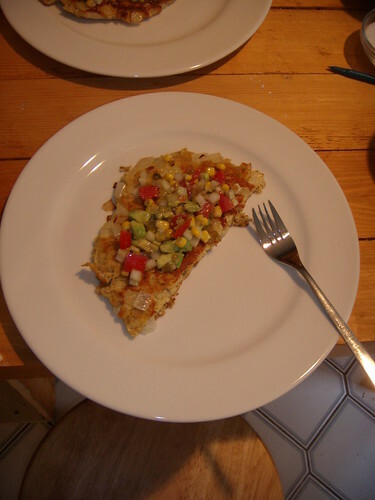 "froja" with a fresh corn salsa, originally uploaded by aarn! +13th April, 2008+. my dad used to make this thing for me that he called "froja." kind of like the love-child of a pancake and a fritata with an italian spin. today's iteration of this childhood breakfast was made of eggs, onions, milk, grated manchego and parmesan, and italian bread crumbs. cooked up like a big fatty pancake, served with some fresh tomato, avocado, and corn tossed together with some of my hot cucumber relish for some kick.